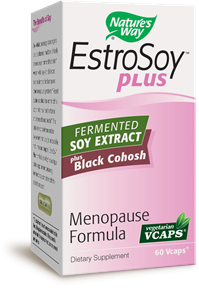 EstroSoy™ Plus is made from fermented soybeans with a proprietary process. Fermentation yields more isoflavones and a diversity of supportive nutrients including beta glucan and glutathione. Because EstroSoy Plus contains fermented soy, it delivers isoflavones (60% genistein and 40% daidzein) in their free, unconjugated forms that are easily utilized by the body.